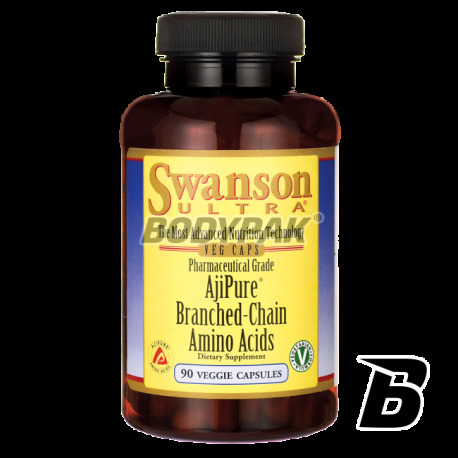 Amino AcidsSwanson AjiPure Branched-Chain Amino Acids - 90 kaps. BCAA Swanson Ajipure - Original sports supplement contains the highest quality BCAA branched chain amino acids (L-Leucine, L-isoleucine and L-valine) in an ideal ratio of 2: 1: 1. Dietary supplement enriched with vitamin B6, which increases muscle protein anabolism. Formula perfect nutrition for any athlete who has a strong anabolic and anti-catabolic, which provides optimum protection for the working muscles. The highest purity pharmaceutical product guarantees Ajinomoto - a Japanese manufacturer of amino acids AjiPure.